A portentous piece; taking one through the darker realms of infirmity & schizophrenia; seduction & possession; dreamscapes & apocalyptic visions; spectral hauntings & the accursed; forsaken love & self-murder; disembodied spirits & forgotten souls; lycanthropes, and of course … vampires. 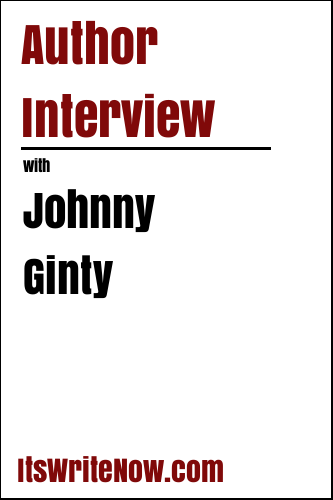 To guide us through the darkness that surrounds the twists and turns of Gothic Twilight, I’ve been joined by author Johnny Ginty. Johnny, there are so many different intertwining threads of darkness that have formed together to make ‘Gothic Twilight’ that I’m not sure how I would describe this work. Can you introduce this book to our readers and myself? Gothic Twilight is the first in a series of books portraying gothic poetry. However, it is not the first book in my Dark Poetry series (see Splinters: Dark Poetry, Volume 1). This book is an engaging collection of fourteen poems (some short, some long) depicting an array of intriguingly eerie and wonderfully dark, gothic imagery; which in turn conjures up a compilation of impressions and metaphors in the mind of the reader. This piece was when writing it, partly inspired by the great gothic writers of the 19th and early 20th century. So, naturally, it does have familiar themes, such as: ghosts, the undead, vampirism, lycanthropy, … etc. ; but these are not the only motifs on display here; for the book delves into other fields of the normal and paranormal – the worldly and otherworldly; taking one through the disconcerting realms of mental and physical infirmity, right through to the unsettling domain of spiritual and corporeal possession. As is always the case, poetry is an art form, as opposed to it being literature per se. Though my poetry does have a tendency to tell a story, there are also compositions in this collection that are not so ostensible, therefore, bringing a more abstract feel to the impressions. So, what inspired the first brush strokes of the abstract word painting that turned into this book? It was actually conceived out of a novella I was considering writing, based on an idea I had for a story about a small group of paranormal investigators. I sat down, started writing, and ended up sticking to what I do, which is poetry. From there, the book kind of just wrote itself, and I just followed along for the ride, never really knowing, from piece-to-piece, what was going to be written next. Do you find that characters pop up in these pieces, or are they artworks without human or character forms? The characters just come all by themselves, by-and-large. They simply work themselves into the artistry as I write: I don’t give it too much thought really. In some cases, the characters are inspired by characters from great gothic novels, novellas and short stories, or from real people in my personal life; even people in the media, or situations unfolding in the news. Do you feel that people or situations from your personal life are one of the strongest drivers as they come from direct experience? Absolutely. In everything I write there is always a little piece of me in there somewhere: sometimes to a greater extent, other times to a lesser. I often write about myself in a very indirect way: mixing fact with fiction – ‘faction’, I guess you’d call it! *Laughs* You might need to think of a new word because ‘faction’ might just get a tad too confusing, especially when trying to unravel the fact and fiction of political factions! When you write, do you use this technique of mixing fact and fiction to share important truths or new ideas to your readers? I never really make statements in my writing. As a writer, I do not feel it necessary. For me, writing is about getting away from all that. It’s about painting images in the reader’s mind, stirring up feelings, triggering emotions and notions. It’s about having a bit of fun, rather than having something important to say. There’s enough time for all of that in day-to-day life. So, in short, from a poetic standpoint at least, I do not have anything important to say. Because you’re not out to make a statement, what gives you personal satisfaction in your writing? Seeing the changes and developments in myself as a writer/poet throughout the production of this book, and the subsequent books that have followed. I love the impermanence of it all. Seeing my style change, I find this very rewarding and insightful, indeed. What have you learnt from seeing these rapid changes in your work and your written style? As I mentioned earlier, the biggest learning curve for me is seeing how my relationship with my work changes so quickly and dramatically. I will always see myself as ‘a work in progress’, never the finished article; and this is true of my poetry: for a poem is never truly finished – therefore never complete – and I guess this is true of myself also. As both you and your writing are incomplete does this mean that a new poetry volume is underway to share the new dramatic route your work has taken? And if so what can you tempt us with? Dark Poetry, Volume 4: (subtitle yet to be agreed). I am almost halfway through this production; but there is a lot more to do with regards to cover design etc. What do you love most about writing and book production? Now that’s a good question … In fact, that’s an excellent question! (laughs) Why, indeed! I’ll get back to you when I find the answer to that one myself! (laughs) I guess, for now, all I can say is, that it’s something I’ve always done, and feel compelled to continue doing. That’s about the best (most honest) answer I can give you for now. Well, I always love an honest answer even if the answer mightn’t be as a clear as I had hoped! Maybe it might be easier to address why you love writing from another angle. Who do you think about when you write? Who indeed! Earlier you mentioned you don’t have a large amount of direction when you start writing. Is that always true, or from time to time do you find yourself plotting out the events of your books before you start typing? I never have the slightest clue what direction my book is going in, let alone how it will end. I write in a very aleatoric way, leaving a lot of things to chance. I think one can afford to be like that when one is a poet. Having said that, I always know when a book is done and there is no more to be written. I find the solid end of your books very interesting because from an outside perspective your writing technique seems very random. Do you think you have a random writing technique, or are there structures behind the scenes that we can’t see? I have a very unorthodox way of setting about my work, and it would take me quite some time to explain it in full. The techniques and styles I use are very Dadaist; which means my approaches and attitudes fly in the face of convention, and are really not what would be taught or advocated on a creative writing course. In short, I do not find words to fit my theme/emotion etc. ; the theme/emotion etc. finds me through the way I collocate words and groups of words. I then weave these wordings together, in the same way an artist might mix his/her paints on a palette, in an effort to create something new. This approach is more apparent in my more recent work (Dark Poetry, Volume 3: Views From A Gothic Window) and also in my upcoming publication. I’m guessing that as someone who is looking at writing like it is painting that you do your own editing? Yes, I do all my own editing and proofreading – I wouldn’t have it any other way. We did touch on this earlier, but do you feel that your voice as an author has improved as you have continued to paint with words and touch them up through your editing process? I’m in fine voice, thanks! (laughs). As with all the areas of my writing, I feel that this is something that’s always subject to change; and long may it continue changing and developing. I’m not sure whether this is something that improves for me, or not; but it’s an area that I certainly grow stronger and more confident in. Looking back on the progress, strength and confidence that you have built in your writing career so far, what takeaways do you feel that you can share with other authors? You have to keep writing because, that’s what writers do – they write! Too many ‘writers’ sit around these days talking about writing, publishing, marketing, branding, promotion, Facebook, Twitter, websites, social media etc. to the point that is all they do. I’ve seen Indie authors get so caught up in this stuff that they are no longer writers: they just think that they are. It would be like a cook sitting ’round all day long talking about cooking, but not actually doing any cooking … Would they still be a cook? Further to this, BELIEF! If you believe in and like your work, then there is every chance that there are readers that believe in and like your work also. It stands to reason. Basically life is a balance, therefore writing is also. If one can get a healthy balance between the above-mentioned factors, then one’s self-publishing life should be a good one. So summed up this would be? Keep writing. Keep believing. Keep learning. But most importantly, … ENJOY!! Enjoyment should always be number one! And now I’d love to move our author interview into territory that I have a feeling that you and your eccentric style would enjoy, our quick-fire question round. Let’s have some fun straight away with our first question, why is lemon juice made with artificial flavour and dishwashing liquid made with real lemons? That’s what some of the packages say. The wonders of marketing! Oh, here’s one you’d like if you were in a vehicle going the speed of light, what happens when you turn on the headlights? You’d disappear! How cool would that be? Or, maybe you’d go back (or forward) in time! Nope, I still think you’d disappear! I like the touch of mystery and intrigue that you could stir up when you disappear! In the mindset of why things may or may not exist, why isn’t there mouse-flavoured cat food? There is at my local store! Mind you, the owners are a family of cats, or cat-people, I think, or something like that; I never go in there – I’ve got a dog! Hmmm, I’m not sure if I should be disturbed or not that there really is mouse-flavoured cat food out there. Maybe you need to be a cat person to truly appreciate the wonders that are mouse-flavoured cat food? What is your zodiac sign? So you’re a follower of the Celtic Zodiac? I was actually looking for the astrological zodiac, but the Celtic one works too. Now, are you left or right-handed? I guess I’m what you might call mixed-handed. However, I’m predominantly left-handed. I was hoping for a really cool monster mix! Maybe we might have better monster odds with the next question, what happens if Batman gets bitten by a vampire? He would have immortality! Mind you, I think he must already have that! … How long has he been around now? Long enough to suspect that he may in fact be immortal! On pondering the length of life, what do you think happens when you get scared half to death twice? I wonder if you get to pick what you can be reborn as after these overwhelming scares. Keeping scary in our sights, if you could breed two animals together to defy the laws of nature what new animal would you create? *Laughs* I think you’ve been looking at my joke stash! I think we both need to work on our jokes! But with minds like these we should be able to solve big questions of the universe like if nothing ever sticks to TEFLON, how do they make TEFLON stick to the pan? I’d imagine the pan is made from Teflon. Oooh, now that’s an answer I hadn’t considered. But maybe that solves the conundrum of the TEFLON pan! As a poet, I know that you have a deep love of words. What’s your favourite one? Nice choice. And I’m guessing since you pick favourite words of the day, you might apply daily favouritism to lines in your own work. To close out the interview and tempt our readers, can you share today’s favourite line from ‘Gothic Twilight’? What avails the observances against the fate of humanity? We may never know. But perhaps we can explore the observances and fate in the pages of ‘Gothic Twilight’. Johnny thanks for sharing your love of words with us today, and I hope to see your love continue to your next volume and beyond! Excited to read the book we discussed today? Find it here on Amazon: ‘Dark Poetry, Volume 2: Gothic Twilight ( ASIN: B075NKYCYD )‘.